Tampa voters have learned that the current midterm elections have irrefutably accentuated an important axiom: Always question the veracity of state Rep. Janet Cruz. That even applies to her name. The desperate Cruz, a Democrat polling behind state Sen. Dana Young in SD 18, has been hurling mud against the wall hoping something will stick. Those accustomed to Cruz’s rhetoric are attuned to her buffoonery and deception. During a public forum last week, Cruz blamed Young for the obsolete, non-functional air conditioning systems in many Hillsborough County schools. Seriously, she did. Observers said the inane accusation was met with eye rolling and muffled snickering. Of course, Hillsborough County schools, financially distressed as no other county in Florida, are the responsibility of the local school board, which for years has been derelict in its budgeting. An infamous 2016 study costing $818,000 advised the Hillsborough School District how to stop wasting taxpayer money. Now the school board has come begging to Hillsborough County voters for a half-percent sales tax increase to bail itself out of its self-made economic morass. The financial woes of the school board go back to 2011, the year after both Cruz and Young were elected to the House for the first time. Blaming Young for deteriorating infrastructure is transparent lunacy and smacks of desperation as the campaign enters its final weeks. Earlier in the campaign, Cruz alienated public education advocates with her announced endorsement for former school board member Susan Valdes, a proponent of charter schools. Valdez, running for Cruz’ House seat, took contributions from charter school operators in her last school board campaign in 2016, so it was no mystery to anyone where she stood on the public school/charter school issue. Cruz’s endorsement held until it was publicly revealed that Valdes reneged on a campaign promise that she would not accept contributions in 2018 from charter school organizers. Cruz, then with much fanfare eight days before the Democratic primary, withdrew the endorsement only hours after Tampa Bay Beat ran a story about Valdes’ duplicity. Cruz has also attempted to pass herself off as a gun control advocate, but as reported last week, she refused to vote for legislation supported by parents of Marjory Stoneman Douglas High School students and opposed by the National Rifle Association. Young voted for the bill. The ultimate hypocrisy: Cruz tells Tampa voters she was motivated to run against Young because of the February school shooting at Marjorie Stoneman Douglas where 17 students died. Janet Cruz was known as Janet Rifkin until she decided to run for office in a heavily Hispanic House district in 2010. 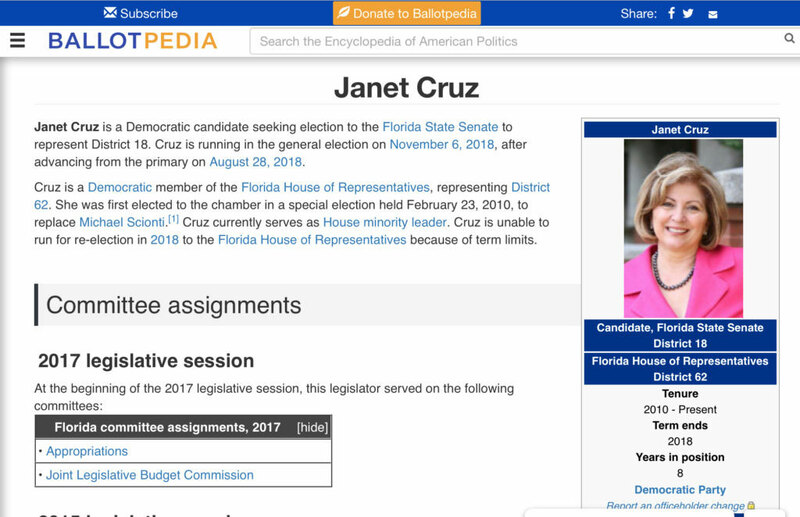 Ballotpedia, the definitive political bible, lists “Janet Cruz,” but there is no “Janet Rifkin.” District 18 has way more Cruzes than Rifkins voting. 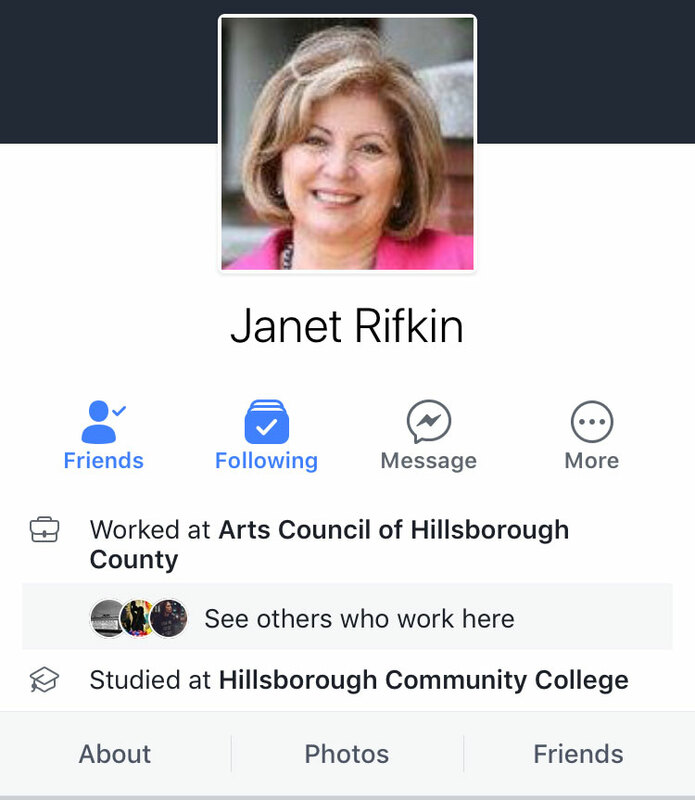 Janet (fill in the blank) is listed as “Janet Rifkin” on her Facebook page (below). When it suits an audience or her business, Cruz will hyphenate her last name. So, depending on the situation, she calls herself Cruz, Rifkin, or Cruz-Rifkin. Cruz told the Tampa Tribune eight years ago that she was running as “Janet Cruz” in order to “avoid confusion.” Rim shot. The Cruz campaign has been a shipwreck since it set sail. After declaring her intention to file for a Hillsborough County Commission seat, Cruz inveigled her way into the state senate race. She avoided a bruising primary by forcing construction attorney Bob Buesing, who already declared against Young, to step aside. An attempt to reconcile with the party’s progressive element failed miserably. The most recent SD 18 poll shows Cruz polling only 64 percent among Democrats. I agree with Michelle. With all the unfavorable Cruz news everywhere, her operatives are bombarding all comment sections. Jim Blyer this is your second hit piece about Janet! Again you fail to tell the entire story, the entire truth! First of all Janet is half Spanish and half Italian born and raised in Tampa! Her maiden last name is Cruz and her married husband's last name is Rifkin! She is not pretending to be Latin like Dana because she is like most of her constituents in her district! Dana young voted for a watered down bill on gun safety and against providing millions of dollars for education in Florida! Those are the real facts left out of your biased and dispicable piece! But don't worry because Hispanics like me know who the real Tampa native and Latina is and we will be voting for Janet Cruz on November 6th 2018 for state senate in our district! Vamos Janet estamos contigo! You got this Janet we're with you! You miss the point entirely. Janet is either ashamed of being a “Cruz” or a “Rifkin” or more probably both depending on the situation. Gossip-mongering and back-biting. Article is a waste of space. Dana Young will win this race. She is a better candidate, works harder and is sharper. She also showed courage to vote against the NRA which believes it owns everyone. Good for her. Showed courage? Are you kidding me- Dana Young dodged a vote to ban assault weapons. She’s a coward who has lost my vote. It’s obvious Cruz has her campaign staff taking tirns commenting here. Not one thing they’ve written has any validity. Protect the biggest opportunist in the state legislature at all costs!!! This is a column, Indy. You know a column is opinion, right? Also, Bleyer is a deep blue Dem (look at his blog site) who is brave enough to call em likes he sees em, regardless of party. Repubs are getting desperate and Young won't even show she is a repub in her TV ads, you have to get close to the TV to read it! !…………….And yes Young voted to give all the school building repair funds to charter schools, leaving a big hole in public school's budget just when having to deal with multiple unfunded mandates from the state among other gifts of taxpayer money to corporations...………..I think I see why he, Bleyer, is a former reporter, as so biased as this article is...…...So how much did they pay you for this hit job Jim?. I know Jim. He is unbought and unbossed. Accusing anyone of being on the take when they are not is considered defamation. Take it from me. I’m an attorney. Amen! One of Dana’s cronies left a brochure at my door. She touted supporting education and protecting our environment. Neither of which are close to the truth. As a practicing therapist I’d say Jim Blyer is nothing but an angry opportunistic liar. We won’t be fooled.